DeKALB is proud to be recognized as a Three Star AchieveWELL organization. AchieveWELL is an award winning, proven strategic process, developed by the Wellness Council of Indiana, which provides a road map to the destination of a good workplace while recognizing excellence in the field of health promotion. AchieveWELL works with companies and organizations by providing tools and coaching help to create a more consistent work place. 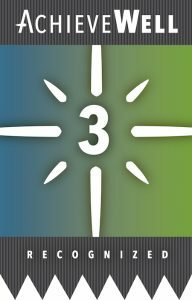 To become a Three Star AchieveWELL organization, DeKALB made several strategic changes to help promote wellness throughout the organization. Implementing wellness was well received amongst our leadership team and become apparent by their participation and encouragement in companywide challenges, up to and including the president/CEO. Challenges were a great to introduce wellness into our culture and helped build moral and camaraderie amongst the employees. And, there’s nothing wrong with a little friendly competition. In addition to challenges, we also introduced healthier vending machine options. Healthier items are encouraged but we don’t take away people’s choices by eliminating completely. Healthier selections are available at a slightly lower cost which is yet another encouragement. Improving our overall communication and education opportunities was key for our employees to be successful in their wellness journey. Provide the information and opportunity, the rest is supported by their strategic focus to live healthier. Wellness is ingrained in both DeKALB’s mission and vision. We are not satisfied with a Three Star AcheiveWELL certification, and DeKALB is committed to becoming Four Star certified in 2017 and Five Star in 2018. DeKALB also received the 2016 MAPP Innovation Award. Capturing over 120 votes for the water manifold entry, voted on by plastics professionals in the United States, DeKALB won the award by a landslide. Along with the title the award came with a monetary to award our employees for a job well done, free entries to a future plant tour event, special recognition during the 2016 MAPP Benchmarking Conference, and recognition in the national industry publication Plastics Business.